Monteverdi’s madrigals have been served so well and so richly that ensembles must be pretty sure of their ground before tackling them. William Christie’s Monteverdi never struck me as his strongest suit; but here Les Arts Florissants are led by their Assistant Director, Paul Agnew (who also sings), and the results seem to me to rival Concerto Italiano or La Venexiana at their best, though they take a rather different approach. Agnew’s selection is impeccably judged, taking in excerpts from the middle third of Monteverdi’s madrigal output, Books 4 to 6 (issued in 1603, 1605 and 1614 respectively), covering what Agnew loosely terms his ‘Mantuan’ period and culminating in the Lamento d’Arianna, the Sestina and the sublime ‘Zefiro torna’. 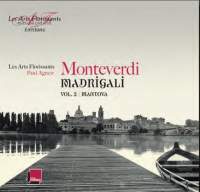 As Agnew admits, Book 6 is on such a sustained level that choosing ‘Les Arts Florissants’ lighter timbre makes for an elfin capacity to render changes of mood that can be properly breathtaking’ from it is a challenge in itself, but the three pieces he selects are among the most ambitious of Monteverdi’s output until that date and thus a fitting place to end. There is a coda, however, which is also logical in its own way: this is ‘Questi vaghi concenti’ from Book 5, whose obbligato violins announce the direction in which Monteverdi was to take the form subsequently. (The instrumental consort here surpasses those of the Italians mentioned above and the singers’ thoughtful tone is at least as convincing.) Agnew explains his choices in a particularly illuminating, thoughtful text: in Book 6 in particular, I’d say they’re spot-on. Les Arts Florissants have not so rich a sound as their Italian counterparts but the lighter timbre makes for a texture of rare transparency, an elfin capacity to render changes of mood that can be properly breathtaking: ‘Cruda Amarilli’ from Book 5 illustrates this nicely and is practically flawless from beginning to end. The consonantal crunch at the beginning may be an obvious trick but it’s so perfectly executed that one wonders how Rinaldo Alessandrini could have resisted it; cannot the obvious solution be the best, particularly when it launches such sharp sallies straight afterwards? Myrtillo’s invective against Amarilli has the force of a flung gauntlet (‘più sorda e più fera e più fugace’) but is also a fine example of sprezzatura, the casual virtuoso elegance that was so prized at the time. Such a moment captures not just the essence of a piece but an entire aesthetic. It is with Book 5 that the recording really comes alive (though there’s much to admire in Book 4 – try ‘Sfogava con le stelle’ or especially ‘Sì ch’io vorrei morire’), and the ensemble’s compactness and lucidity pay equal dividends in Book 6. Much as I value Alessandrini’s Monteverdi (and his Book 6 in particular), his mannerist approach – while appropriate on a number of counts – can make the formal trajectory of even the shorter pieces of Book 4 harder to grasp at first hearing. This is done deliberately and for very perfectly valid reasons but it is good to have a more directly ‘legible’ account that matches it technically. In the Lamento d’Arianna honours are even, insofar as Alessandrini keeps a firm hold of the narrative thread, which however is loosened to good purpose at the end. Agnew’s ensemble places greater emphasis on the soprano, so that one can imagine the piece more readily in the context of the lost opera whence it came: there is more bite in the climactic sections. And so to the Sestina, where Concerto Italiano’s darker hues better suit the subject-matter but Agnew’s decision to dispense with continuo imparts a concentrated sparseness that is just as distinctive. This is some of the saddest music that Monteverdi wrote – not Arianna’s theatrical desolation but its interiorised mirror image. In this sense the two works, both of roughly equal length, complement each other perfectly (compare for example the cries of ‘Ahi me’ just before my chosen extract in stanza 5 to the opening of the Lamento). The recorded acoustic gives the ensemble little to fall back on: this is consort-singing without a safety net, risk-taking that pays dividends. I cannot conclude without mentioning ‘Zefiro torna’, whose closing section is one of the most erotically charged of all the madrigal literature. Les Arts Florissants are every bit as involving as Concerto Italiano: again they are lighter on their feet, aided by the intricate passagework of an effervescent continuo section. That astonishing conclusion is all the more effective. The lavish accompanying materials are beautifully presented (they include very evocative photographs of the concerts associated with this recording), but are not without errors: the composer’s birthdate is given incorrectly in the first line of the introductory text and the painting reproduced on page 28 is no longer thought to represent him. A separate booklet contains a short story by René de Ceccatty, through whose narrative Monteverdi’s music runs like a thread (albeit at times a barely visible one). Finally, if you’re wondering why this recording focuses only on the ‘middle period’ madrigals, it’s because two further ones will eventually complete the chronological sequence on either side: I look forward to them. And if you don’t know a note of Monteverdi’s madrigals, this single volume should be enough to persuade you that you ought to have done, long ago.